He has escaped from countless life-threatening situations, prefers his martinis shaken not stirred and is one of Britain’s most iconic exports. So it is no wonder James Bond has been charged with the task of boosting tourism to the UK. This week sees celebrations to mark 50 years of the legendary spy and on Friday October 5 – Global James Bond Day – a new advertising campaign featuring 007 will be launched by VisitBritain. 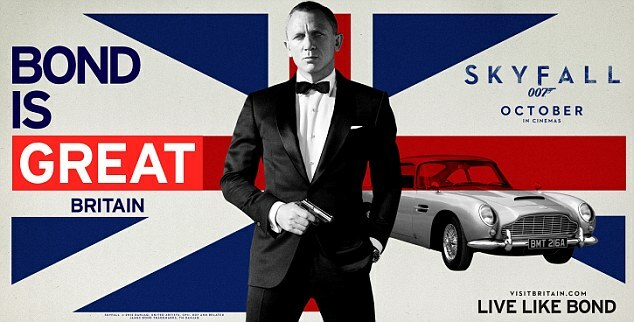 Print and outdoor advertising across 21 countries will be based around the slogan ‘Bond is GREAT Britain’, a play on the ongoing ‘Great’ campaign launched to coincide with the Olympics. And Britain’s first ever film tourism advert starring the spy through the years will be played in cinemas in popular inbound destination such as Australia, Brazil, Germany and the U.S. The imminent release of the 23rd Bond film Skyfall, filmed in iconic London location including the National Gallery, Whitehall and Greenwich, as well as Glencoe and Glen Etive in the Scottish Highlands, where Ian Fleming’s family once owned a home, will also be used to encourage tourism. And to encourage digital and social media fans of the film to interact with Brand Britain, a Skyfall experience called ‘Agent UK’ will lead them through five online missions to find the hidden location of a rogue agent and the chance to win a luxury trip to the UK. A further competition, run in 21 key countries across the world, will also offer winners the chance to ‘Live like Bond’ during a trip to the UK. Sandie Dawe, chief executive of VisitBritain said: ‘007 has orchestrated many critical missions for Queen and country – including escorting Her Majesty to the fantastic Opening Ceremony of the London 2012 Games – so it is only right that we call upon his services now to encourage more people to holiday in Britain.